Legio Photo Blog: Can the KPS T5 handle ...? Recently, a customer asked whether the KPS T5 geared ball head can handle heavy cameras. Such question is not uncommon. So, we thought a picture would be better. Below is a picture of the KPS T5M Geared Ball Head with an equipment weighing 13.8 lbs (about 6.26 kg). We mounted Celestron Omni XLT 120 telescope with Canon 5D Mark III camera. 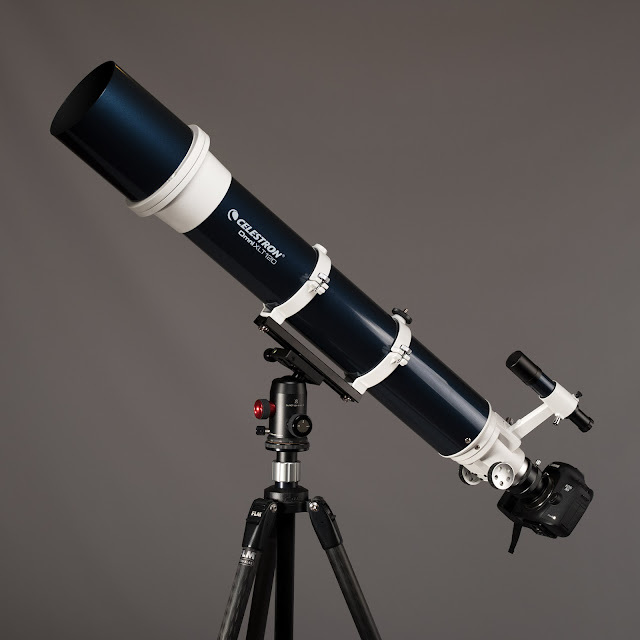 According to Celestron's website, the telescope weighs 12.5 lbs and is 40 inches long. According to Canon, Canon 5D weighs 33.5 oz (2.09 lbs). So, the total should be 14.59 lbs, but according to our digital scale, the combination weighed in at 13.8 lbs. Even the Canon EF 800mm f/5.6L IS USM lens weighs "only" 9.9 lbs and is 18 inches long (that's less than half the length of the Celestron telescope). It is not that we are recommending that folks use KPS T5 instead of the telescope's equatorial mount. The Celestron equatorial mount with counter weight would be much better for star gazing. We did this just demonstrate what the KPS T5 is capable of. We used FLM CP30 Pro tripod with KPS T5M. T5M is the screw knob clamp version of the T5.